As you should noticed that your upload videos will be stretched to fit the player in video sharing sites. You may also have the experience that the quality of upload videos were getting very poor. The reason may be the dimension of your upload video that is not with correct proportion of the player. We will take the most popular video sharing site, Youx as an example. The shapes of upload videos can either be square or rectangle (wide). For square video, there will be black area in the left side and right side of the player. If you like your video filling up the whole player, a rectangle or wide video should be prepared. 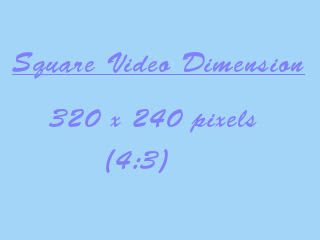 To have best result for square upload video, a 4:3 ratio of upload videos dimension are recommended. A good video size should be 320 width x 240 height pixels. So far the upload videos dimension maintain a ratio of 4:3, a good result may be expected. 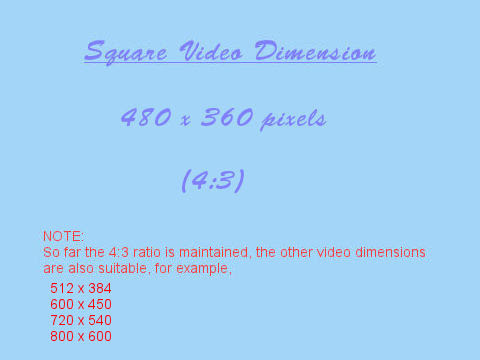 Therefore the following video dimension (480 width x 360 width pixels) is also suitable. The following example is a video prepared with dimension 512 x 384 pixels. In fact most videos I made many years ago are in this 4:3 format. The quality of the video is a bit blur. To have best result for rectangle (wide) upload videos, a 16:9 ratio of upload videos dimension are recommended. A good example of video size should be 640 width x 360 height pixels.